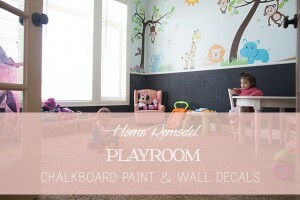 Ansley’s room has been under renovations for the last three years. The theme that I’m going for is a white, cream, and lavender feel. It’s been a journey to figure out what to put above her headboard. 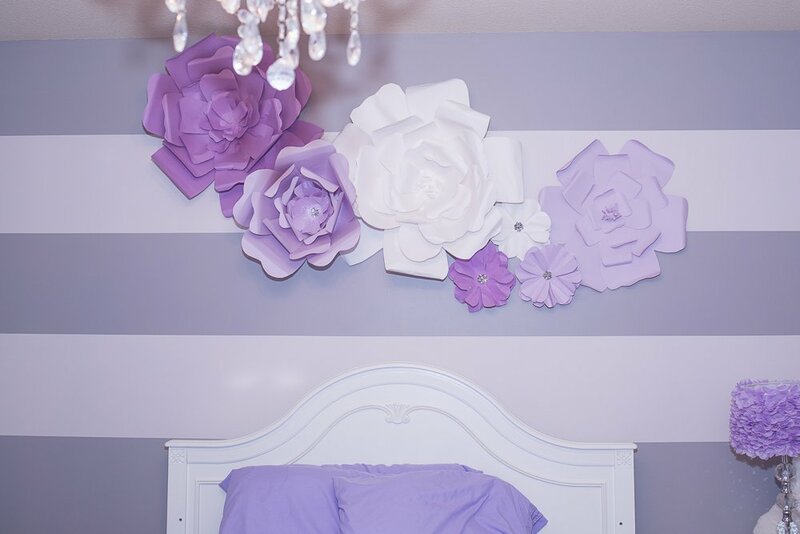 I’ve been pinning ideas to my Above Bed and Headboard Decor for some inspiration. 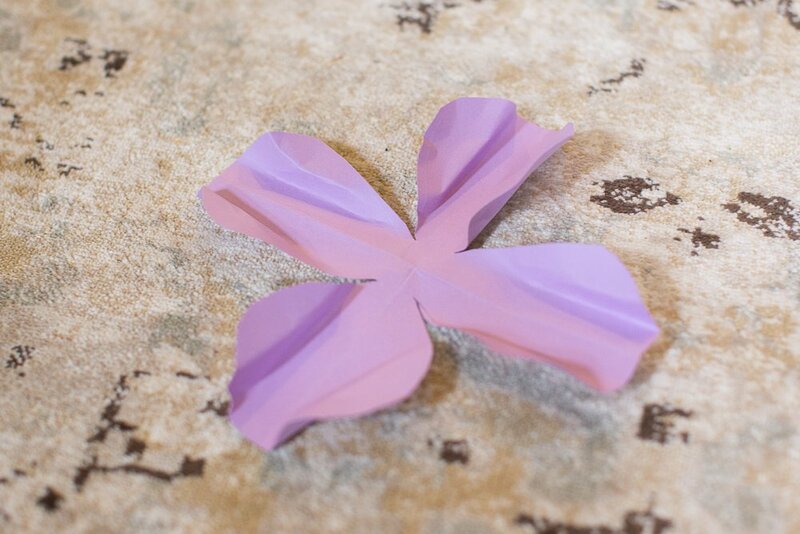 But then I saw a blog post from Sugarbee Crafts for her small paper flowers tutorial and thought it would be awesome to make a HUGE version of this for Ansley’s room. But I wanted specific colors and a variation of flower sizes. So I figured I’d make my own. It couldn’t be that hard right? 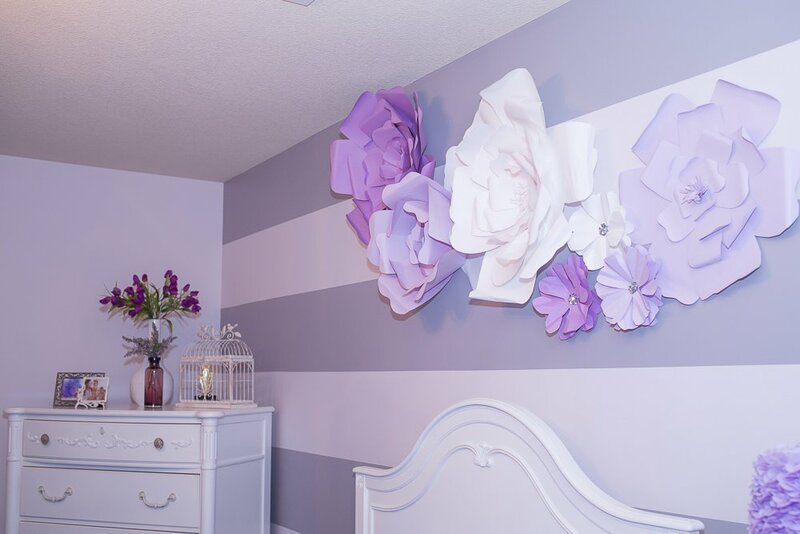 Here is my Pinterest board on my big flower tutorials and inspiration on what I settled on for Ansley’s room. 1. 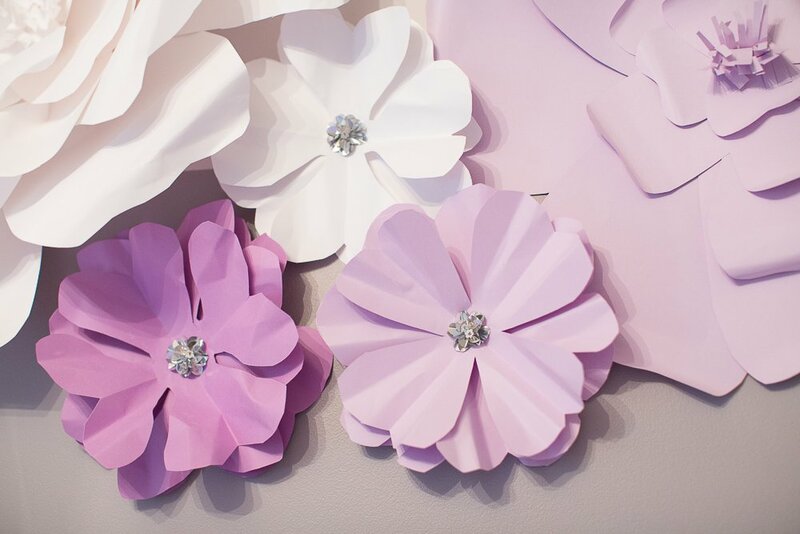 I used this YouTube video (pinned on Pinterest) for the large paper flowers. 2. For the small paper flowers, I used this YouTube video (again pinned on Pinterest) for the small flowers. I will warn you, its in Thai. So just mute and play it in slow motion. Here’s how it turned out. Note that this is NOT the room reveal. I need to get two more walls done. 1. 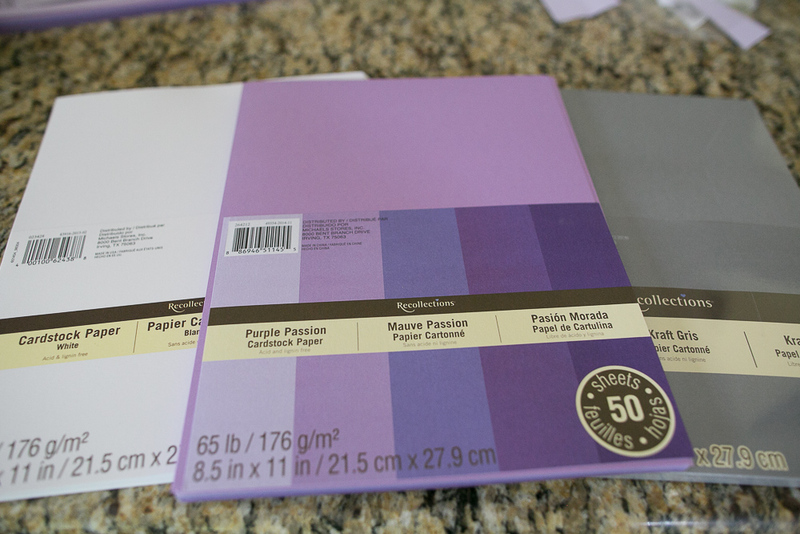 For Ansley’s room, I chose a white, lavender and dark purple card stock. Although its pictured below, I ended up not using the grey because would overpower and not match well with the other colors in her room. 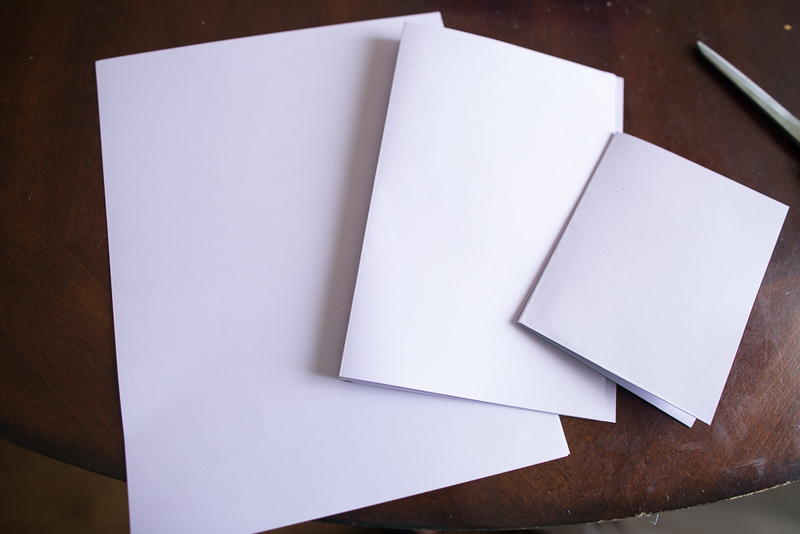 You are going to need 8 in full size sheets, 6 sheets cut in half (total of 12), and 4 sheets in fourths. 2. 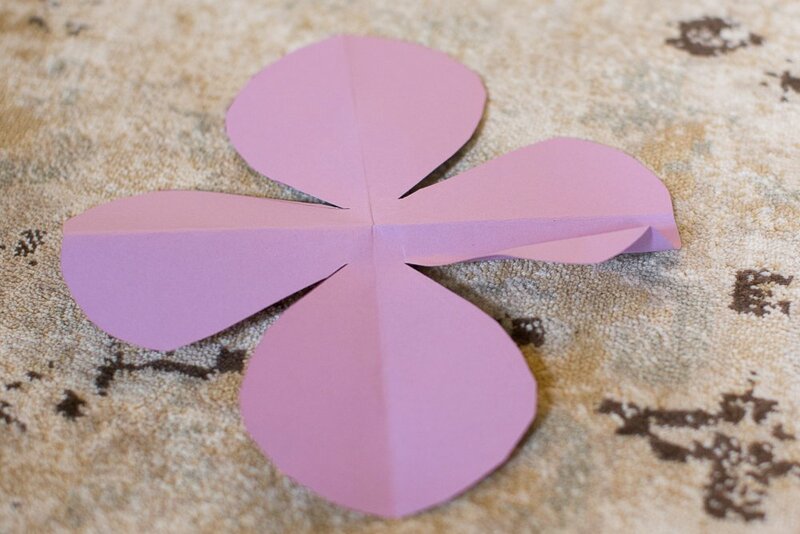 Cut the sheets so you have groups of petals like below. 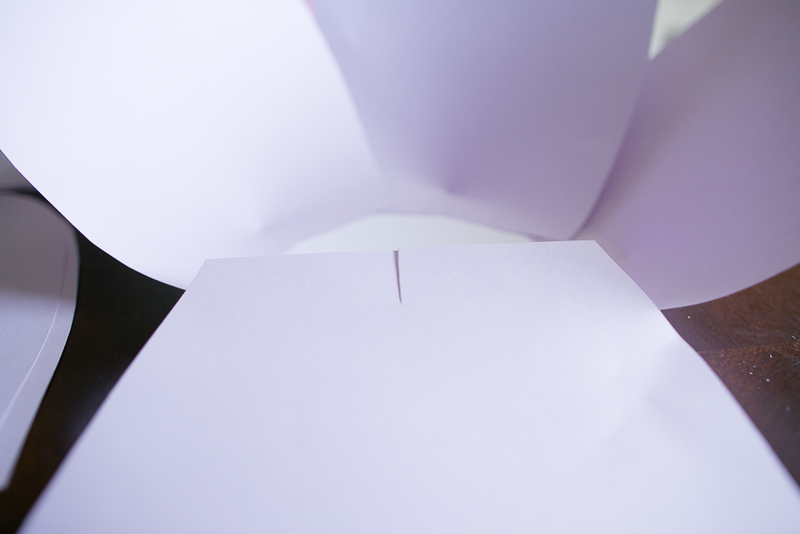 When you cut the petal ends, make sure you make them irregular so that it looks natural. Note that not all of my petals look the same. 3. 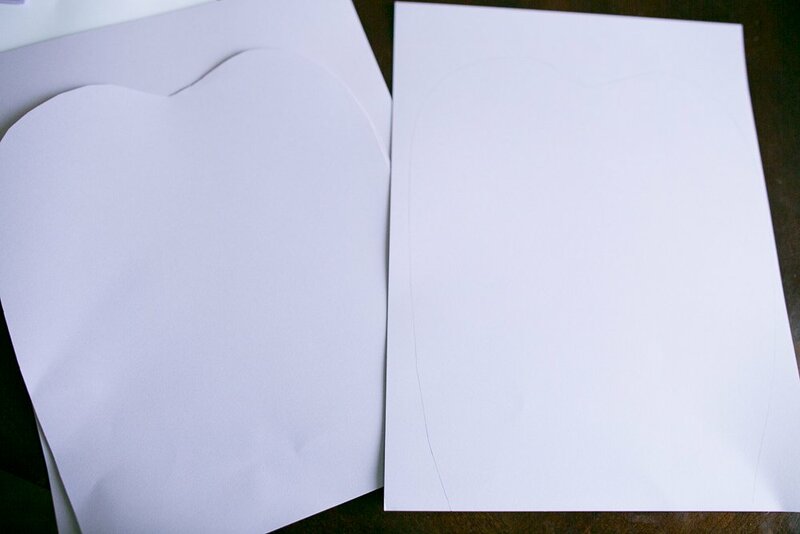 For the “core piece” that is held together, find something circular around the house you can use to trace a circle for the middle of the flower. This is where you’ll start your base. My circle was 8 inches in diameter. 4. Cut a 1/2 inch slit in each of the petals. 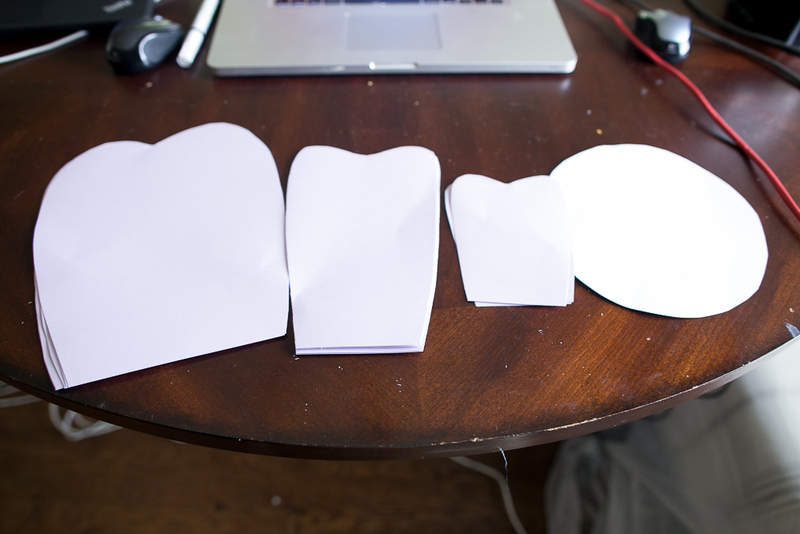 This will allow the flower to have a natural curve when you glue it to the base. 5. Next, glue the large flower petals base. 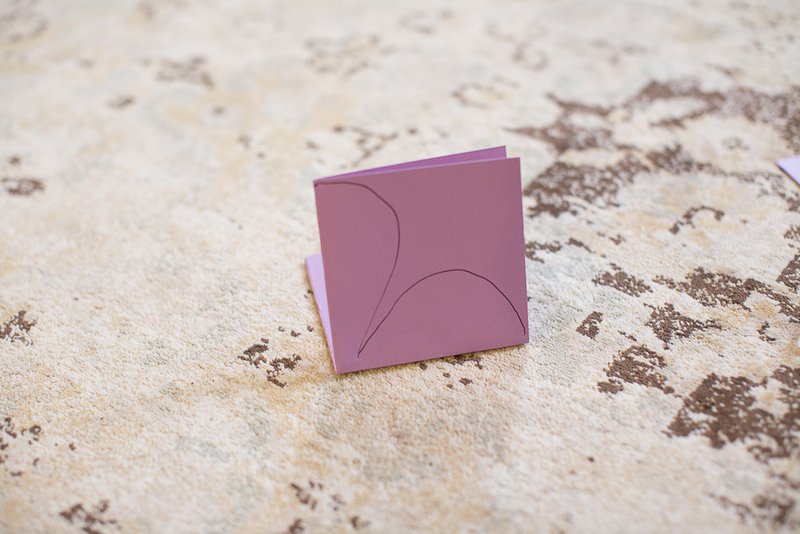 Note that if you glue the slits so they overlap A LOT, it will make the flower sit “up” more, you don’t want that. 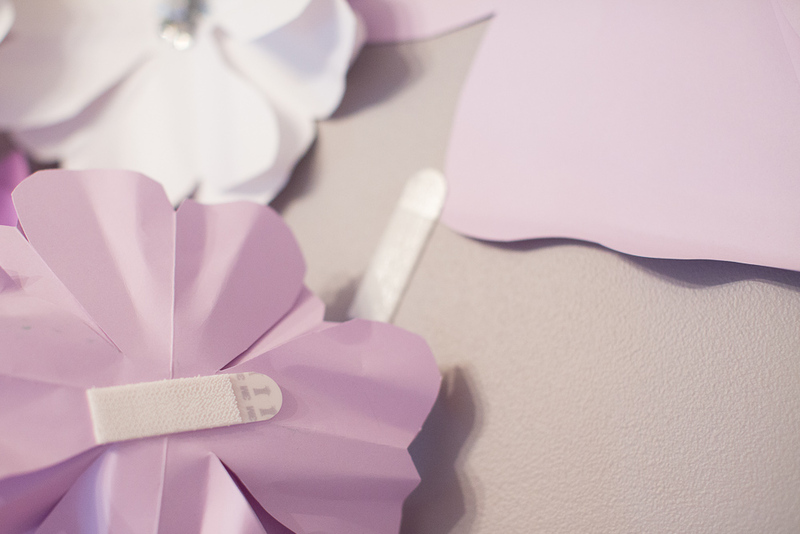 You want to loosely overlap the petals, but make sure that the glue is on good (use your hot glue gun). 6. Then overlap the half pieces. Glue that down. Follow that with the quarter pieces. 7. For the middle of the flower, you can purchase some bling and glue it to the middle or take a scrap of paper and cut a bunch of frills in it to glue in the middle! 8. Then take a pen or pencil as a mold. 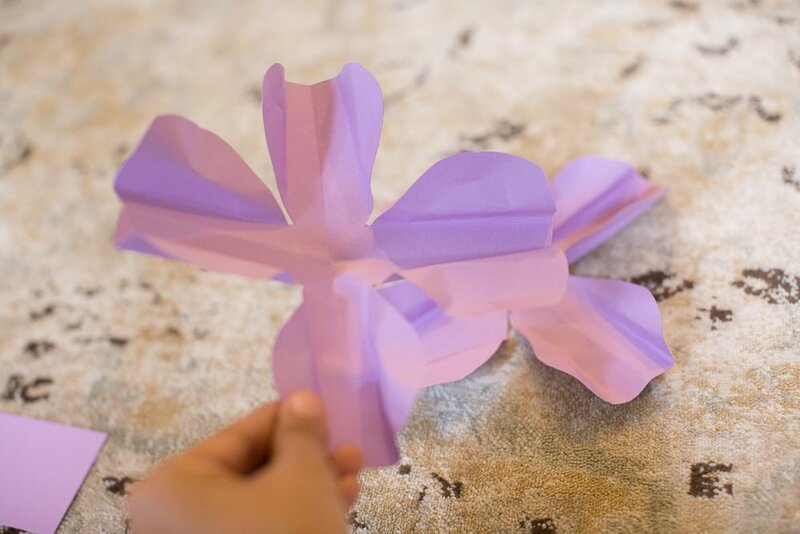 You are going to use it to wrap the end of the petals around to fold them so it looks like a 3D flower. 1. 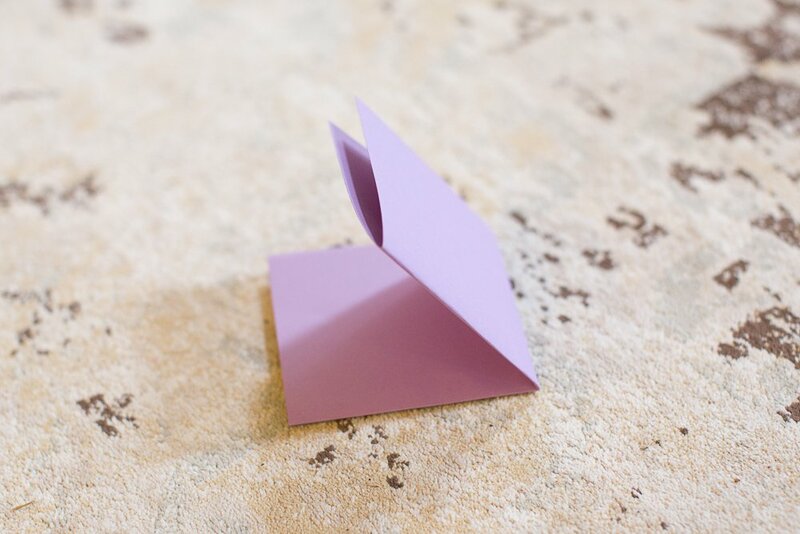 Cut your paper into a square. 5. 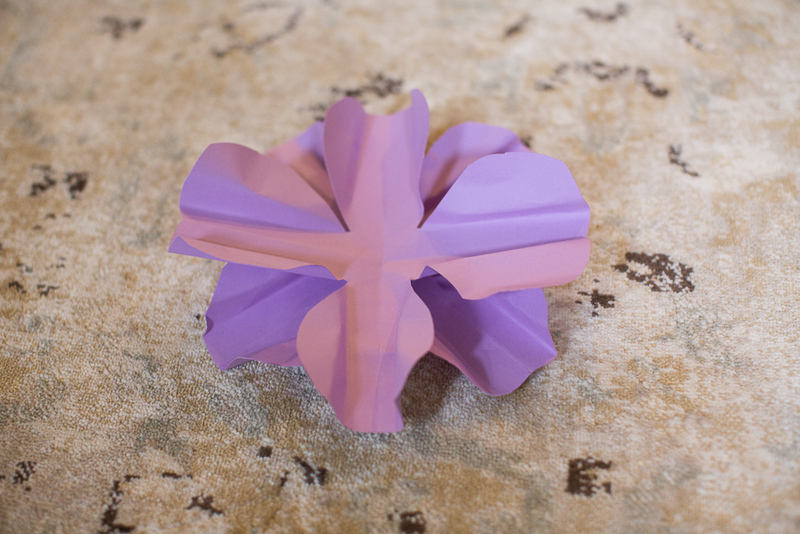 For the 3D part of the flower, just fold the petals every which way until you get it like you want it. 6. Repeat the above steps two more times. 7. Stack all three flowers together. 8. Find some bling (or make your own) for the center of the flower. I found these at a local craft store ages ago. I’m sure you can find something similar in the scrapbooking aisle at Target or your local craft store. I made the mistake of putting a wall collage with empty frames in her room and ended up hating it. That also meant tons of nail holes in that wall. To avoid that same problem, I came up with an awesome solution on how to hang this floral collage up. Command strips!!! Even if I messed up my placement of the flowers, I could change the location without messing up the wall. How amazing is that?! You could position it until you have it looking like you want it. 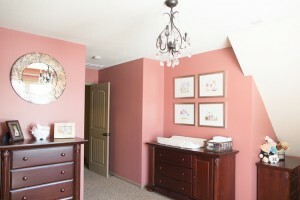 If you haven’t already, check out my post on how to paint wall stripes) and pin with me on Pinterest! 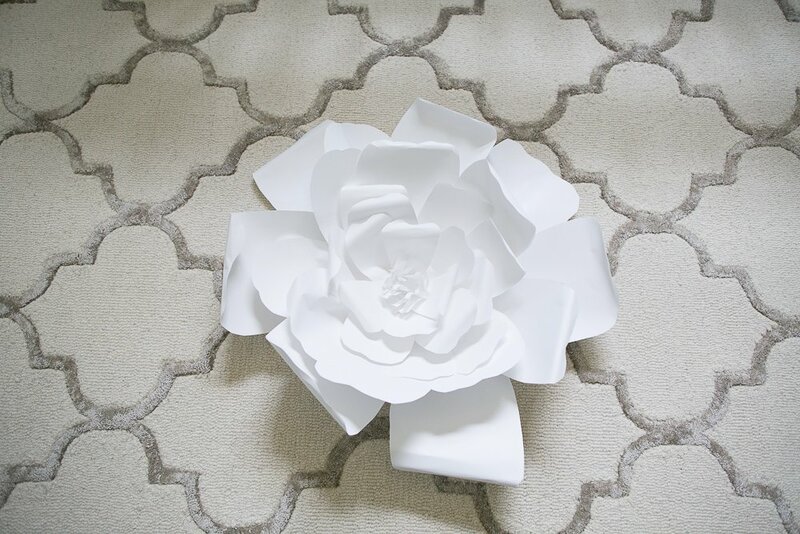 If you loved this large paper flowers tutorial, you may also be interested in these below. 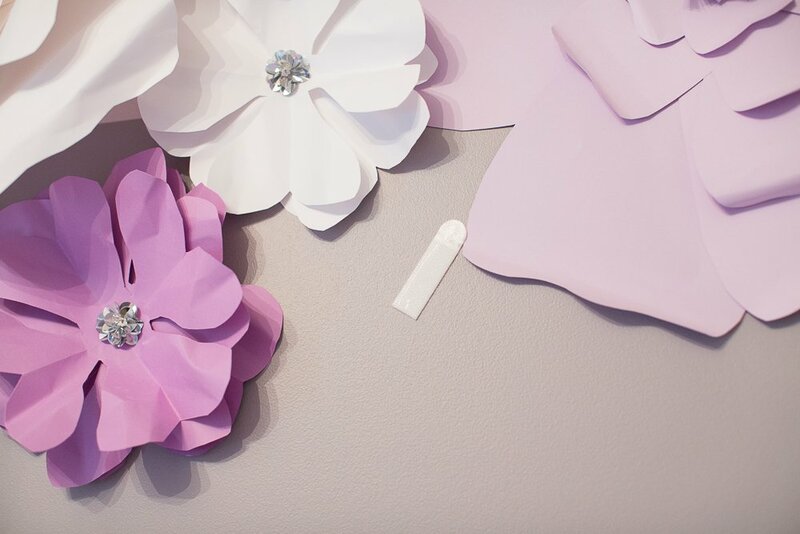 If you love this large paper flowers tutorial, be sure to pin it so that you can refer back to it later! Thank you for taking the time to make this tutorial. This looks so beautiful! May I ask what are the colors you used for the paint? 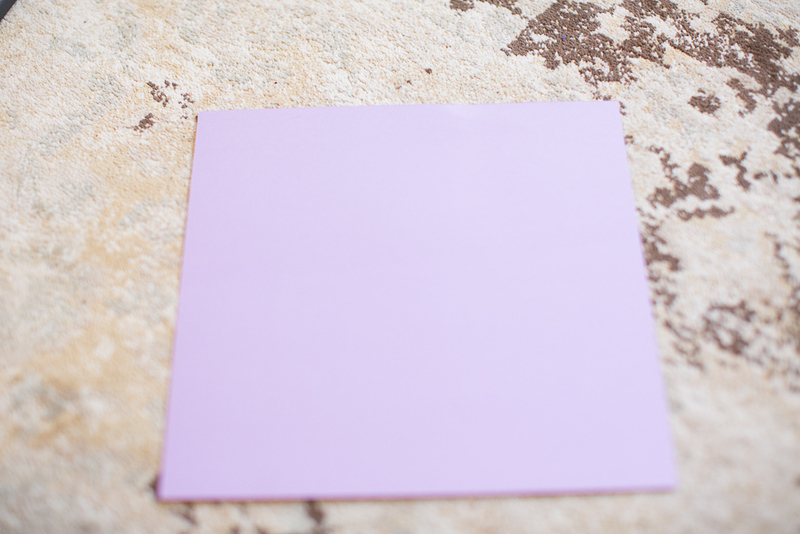 “Antique pearl” for the light lavender, what about that gorgeous dark purple stripe? What’s name of that color?